The teacher, psychologist and I arrived at *Jack's home to meet him and his mother. When Jack's mother had set the appointment, she had expressed concern about her almost three-year-old son's lack of speech and "other strange things about Jack." As we seated ourselves and the floor and unpacked our evaluation toys we noted that Jack sat some distance from us and did not seek the comfort of his mother, as a child usually does when strangers arrive in the home. We learned that Jack's six-year-old sister had recently died of cancer after a long illness and that his parents had divorced just prior to the girl's death. Jack sat with his small hands clenched into fists and warily listened as his mother related that he never spoke and that he constantly held pennies in each hand. These behaviors interfered with his learning, having friends and were about to get him expelled from kindergarten. He would occasionally transfer the pennies to one hand for a task but no amount of pleading could get him to put them down. After the evaluation, we developed strategies to address Jack's speech skills. "But what about the pennies?" his mother asked. And then with obvious difficulty, "Is he autistic?" We asked for time to think about the pennies and the psychologist assured her that we had not observed any behaviors that would suggest that Jack was autistic. I explained that when a child's communication skills improve, undesirable behaviors often fade. The pennies did puzzle us though. That evening, just like any other evening, I opened the bedside drawer to put away my watch. Then I noticed it: an old aspirin tin. Seeing it was an epiphany. 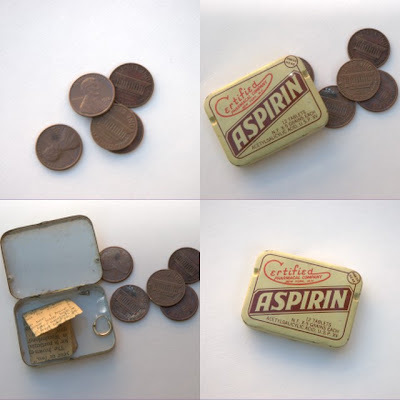 Just like Jack's pennies, that aspirin tin had been my constant childhood companion. Jack was clutching his pennies for the same reasons I had needed that aspirin tin. The next day I told my colleagues that I knew why Jack was attached to the pennies. Those pennies were his attempt at preserving the status quo. He had been unable to hang onto to his sister or his father and he had lost his mother to her grief. He was left with only pennies to hang on to. We were not to take them from him. When we explained this to Jack's mother, she was brilliant. She came up fighting for her son. This was a battle she could win. She began by telling his school that they were to ignore his lack of speech and his pennies. She asked me to bring a "pocket penny" for Jack. During subsequent therapy sessions, Jack sat snug up against his mother as we played with therapy toys on the floor. One day he decided that his pennies could go into his pocket with his "pocket penny." And then he began to speak in long, glorious sentences. Objects, things, our stuff are pinch hitters for better times and places. They are surrogates for absent loved ones. They are therapy for our often fractious lives. Jack learned this early.